From Connie Willis, winner of multiple Hugo and Nebula Awards, comes a comedic romp through an unpredictable world of mystery, love, and time travel . . .
Ned Henry is badly in need of a rest. He’s been shuttling between the 21st century and the 1940s searching for a Victorian atrocity called the bishop's bird stump. It’s part of a project to restore the famed Coventry Cathedral, destroyed in a Nazi air raid over a hundred years earlier. But then Verity Kindle, a fellow time traveler, inadvertently brings back something from the past. Now Ned must jump back to the Victorian era to help Verity put things right—not only to save the project but to prevent altering history itself. 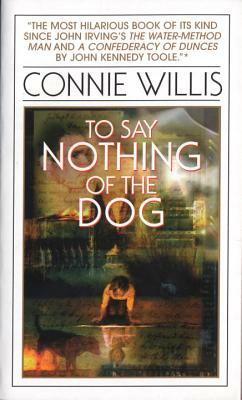 Connie Willis has won six Nebula and Six Hugo Awards (more than any other science fiction writer) and the John W. Campbell Memorial Award for her first novel, Lincoln's Dreams. Her novel Doomsday Book won both the Nebula and Hugo Awards, and her first short-story collection, Fire Watch, was a New York Times Notable Book. Her other works include Bellwether, Impossible Things, Remake, and Uncharted Territory. Ms. Willis lives in Greeley, Colorado, with her family. "The most hilarious book of its kind since John Irving's The Water-Method Man and A Confederacy of Dunces by John Kennedy Toole." "An utter delight. Ms. Willis's unique, engaging voice will carry you off to a place where chaos theory makes perfect sense, time travel is a REASONABLE mode of transport, and safeguarding the fate of humanity is a respectable day job." "Willis effortlessly juggles comedy of manners, chaos theory and a wide range of literary allusions [with a] near flawlessness of plot, character and prose." "I have long thought that Jerome K. Jerome's Three Men In A Boat is one of the highest points of Inimitable British Humor. I chuckle; I gurgle; I know those three men--to say nothing of the dog. And now I am convinced there was a woman concealed in that boat, too: Connie Willis."